Several of you have asked recently about how to build a capsule wardrobe & I’m finally answering your questions today. This isn’t something that I have specifically done for myself, but I definitely see the value in it and think it’s smart to make a pared-down list of essentials that you need for each season. Obviously this will vary based on your occupation and where you live – those who work in a professional environment will need more work-appropriate options and those who live in warm-weather climates will not need as many sweaters or jackets. It’s important to be realistic when creating your list so that you’re only purchasing pieces you will truly wear over & over again. Although it’s only August, I know that most of you are beginning to shop for fall already…so I wanted to help you get a jump start on the new season. 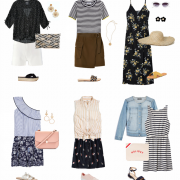 You don’t necessarily need to splurge on high-end pieces when creating a capsule wardrobe – the items I’ve selected below are well-made styles that are also affordably priced (many are on sale now!). I wanted to focus on the core separates you need for the coming season so I didn’t include basics like knit tees, camisoles or accessories like scarves, belts & bags. You can tell just by looking at the garments in this collage how many different outfit combinations you can create (let me know if you’d like me to do a follow-up post showing them all!). Take a look at my picks & then read on below for tips on how to build a closet of mix & match wardrobe staples. 1) Determine the colors you prefer & those that best flatter your skin tone. They don’t all have to be neutrals, but picking pieces in complimentary shades will ensure you can mix & match as many items as possible. 2) Choose items based on your lifestyle – focus on the types of clothes that you wear most often & what you feel your best in. There are many different variations, so if you want a leather jacket but don’t care for quilting or zippered details, keep hunting until you find a style that suits you. It’s important to stay true to your own personal taste, regardless of trends. 3) Understand your body type & what cuts highlight your assets. Once you’ve identified the features you want to play up, you can base your purchases around what kinds of clothes will accentuate your strengths. 4) Set a budget – some recommend breaking down the cost per item, but I suggest giving yourself a total dollar amount to work with. This way, if you’re able to find something on your list for less, you can roll over any extra money you have into another purchase. 5) Find a tailor & get acquainted – because these are wardrobe staples that you’ll be wearing often, it is crucial that they are tailored to your body. Not only will they better flatter your figure, but items always look more expensive when they fit perfectly.